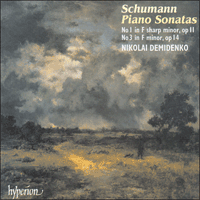 This obvious yet rare coupling brings together the larger two of Schumann's three Piano Sonatas, their passionate intensity suiting perfectly Nikolai Demidenko's style of playing. The disc has the added bonus of containing an additional Scherzo and two Variations from Schumann's earlier thoughts on the Op 14 Sonata. At the piano the fandango idea came to me—I was uncommonly happy when I stopped, and I looked out of the window up at the beautiful spring sky. I felt gentle breezes, and I heard a nightingale sing so fervently—and just as I was thinking of my Papillons a beautiful large moth fluttered to the window. But it kept away from the light, and did not scorch its wings. This was a good sign for me; but the fandango was going around in my head far too much—though that is a heavenly idea with godly figures, and still more adaptable than the masked ball [Papillons]. Schumann eventually decided against publishing his fandango and incorporated it instead into his Piano Sonata in F sharp minor Op 11, where it appears juxtaposed with a ‘rocking’ fifths motif as the opening movement’s main Allegro theme. The fifths idea seems to have been a deliberate reference to the last of Clara Wieck’s Quatre pièces caractéristiques, Op 5—a piece entitled ‘Le Ballet des revenants’ (‘Ballet of the Ghosts’). Clara Wieck’s piece also contains a theme remarkably similar to that of Schumann’s fandango, though it is likely that in this case she borrowed the material from him. The opening pages of Schumann’s Op 11 Sonata are clearly labelled as an ‘Introduzione’, though their fully formed melodic character lends them the aspect of a self-contained entity. Even when the theme of the introduction returns at the centre of the ensuing Allegro, its reappearance acts as an interruption to the music’s developmental flow, rather than being an integral part of it. It is true that the introduction focuses on the motif of the falling fifth which is to form the Allegro’s starting point, but its isolation from the main body of the movement is emphasized by its most unusual feature: the gentle melody that unfolds shortly after its beginning is the theme of the sonata’s slow movement. This startlingly original piece of long-range anticipation is by no means a gratuitous gesture: the falling fifth also features prominently in the slow movement. At the end of the introduction Schumann carries out one of his characteristic experiments in piano sonority, the falling fifth emerging pianissimo out of a blurred swirl of sound. The Allegro is dominated by what Schumann called his ‘fandango’ idea. The only significant contrast is provided by a smooth theme in the major that emerges at the end of the exposition, fulfilling the role of a traditional second subject. Even here, though, the falling fifth motif, with its dotted rhythm surviving intact, is absorbed as an accompanimental figure. Schumann describes the slow movement as an ‘Aria’, and it is in fact based on a song he had written as an eighteen-year-old student. (The song, An Anna, to a poem by Justinus Kerner, was not published until Brahms included it in the supplement to the collected edition of Schumann’s works, issued in 1893.) In Schumann’s piano setting the beginning of the melody significantly unfolds over a sustained perfect fifth in the bass, and its delicate air of understatement is underlined by the marking of senza passione, ma espressivo. When Liszt reviewed the sonata for the Paris Gazette musicale (alongside the F minor Sonata, Op 14, and the Impromptus on a Theme of Clara Wieck, Op 5) he singled out the slow movement for special praise, describing it as ‘a song of great passion, expressed with fullness and calm’. The falling fifths that punctuate the melody are not found in the original song, and were clearly added in order to stress the unity of the sonata’s opening pair of movements. Behind the framework of the third movement lies the notion of a through-composed scherzo with two trios. The tempo quickens for the first quasi-trio whose opening bars are underpinned by the first movement’s ‘rocking’ fifths motif, played pianissimo leggierissimo. The second trio—or ‘Intermezzo’ as Schumann calls it—is written very much tongue-in-cheek. It abruptly abandons the agitated, adventurous style of the piece thus far in favour of what seems to be a parody of the old-fashioned school. The episode is, in essence, an absurdly heavy-handed polonaise, and Schumann marks it, appropriately enough, Alla burla, ma pomposo. There is little doubt that we are here face to face with a Papillon—perhaps an extract from the lost set of ‘XII Burlesken (burle) in the style of Papillons’ which Schumann had sent to the publishers Breitkopf und Härtel in 1832. There is a further surprise in store before the scherzo is allowed to return, in the shape of an orchestrally inclined recitative complete with a ‘Papillon’ that takes flight on the oboe before being angrily dismissed by the full band. And to add to the confusion, the scherzo returns at the wrong pitch before being thrown into the correct key a couple of bars later—a typically Schumannesque touch. There are more orchestral sonorities in the finale: tremolos deep in the bass register while above them the texture gradually increases in weight, like a crescendo over a drum roll; a staccato passage near the close, marked quasi pizzicato; tutti chords punched out at top speed (one of several features in the piece that make it a formidable technical challenge to the pianist). This sonata-rondo based on a duple-metre theme forced into the strait-jacket of three beats to the bar was, in fact, the first part of the sonata to be composed. If it lacks the coherence and dramatic sweep of the opening movement, the music’s élan and inventiveness carry the listener unfailingly through to its triumphant F sharp major conclusion. The Op 11 Sonata was a source of much grief to Schumann. He later described it to Clara as ‘one long cry from the heart to you’, and it is significant that her name appeared in large letters on the title page of the original edition—a display of romantic affection. Schumann’s own name was conspicuously absent, the inscription being simply: ‘To Clara from Florestan and Eusebius’. It was when Schumann sent her the newly published score in May 1836 that he was first made aware of her father’s implacable opposition to any serious relationship between the two of them. Wieck instructed Clara to return all Schumann’s letters, and she meekly obeyed. In the summer of that same year, 1836, Schumann carried out the greater part of his work on the Piano Sonata in F minor Op 14. This was, as he later confessed, his ‘darkest period’—a time when he was completely separated from Clara. If some of Clara’s musical ideas had left their mark on the opening movement of the F sharp minor Sonata, the new work placed Clara quite literally centre-stage: the sonata as Schumann originally designed it had five movements, with the slow movement framed by two scherzos. Not only did the slow movement consist of a set of variations on an ‘Andantino de Clara Wieck’, but the five-note descending scale with which her theme began permeated other sections of the work, too—not least the main theme of the opening movement. It was in all likelihood the publisher Tobias Haslinger who persuaded Schumann to drop both scherzos, so that the work could appear under the catchpenny title of ‘Concert sans orchestre’. This wholly inappropriate designation was criticized not only by Liszt in his Gazette musicale review, but also by Ignaz Moscheles, to whom the work was dedicated. Haslinger’s three-movement version appeared in October 1836, but when Schumann revised the work in 1853 he issued it as a ‘Grande Sonate’. He restored one of the scherzos and also renotated the finale, changing its time signature from 6/16 to a more conventional 2/4. (The latter alteration may make the music look less forbidding on the printed page, but it does nothing to facilitate the playing of what is a fearsomely difficult piece.) Schumann also retouched the opening movement, making occasional changes to its texture, rhythm and even harmony. This is perhaps his only piano work in which the revision is patently superior to the original, and Nikolai Demidenko has generally followed it for this recording. He has, however, retained one or two features from the earlier version that are preferable—notably the sustained chord that follows the flurry of semiquaver activity in the sonata’s opening bars. The revised version has a straightforward chord of C major here, but Schumann originally wrote a discord which propels the succeeding musical argument with greater force and intensity. When Schumann prepared his revised edition of the sonata he did not incorporate the scherzo that was in the home key of F minor. His decision was understandable enough—not only because the work as a whole is more convincing in its tauter, four-movement form, but also in view of the comparative weakness of this scherzo’s trio section. However, the scherzo itself, with its continuously syncopated across-the-bar phrases, is a splendid piece, and it appears on the present recording as the sonata’s second movement. The central variations (or ‘Quasi Variazioni’ as Schumann guardedly calls them) form perhaps the composer’s most perfect and beautiful sonata movement. Once again, however, it was some time before they reached their final form. Two variations included in Schumann’s original autograph were discarded before the sonata ever saw the light of day, and were first published only as recently as 1983. Schumann’s intention as to the second of these—a Prestissimo which carries the heading of ‘Scherzo’—remains unclear, as it appears between the original variations 3 and 4, and is not independently numbered. Perhaps already at this stage Schumann had decided it was superfluous; it has consequently not been included here. Nikolai Demidenko does, however, play the first of the posthumous variations, and in so doing he reverts to what was Schumann’s original sequence for the movement in its more extended form. Au piano, l’idée de fandango me vint—je fus inhabituellement heureux lorsque je m’arrêtai, et je regardai par la fenêtre le magnifique ciel de printemps. Je sentis de douces brises et entendis un rossignol chanter avec une telle ferveur—et juste au moment où je pensais à mes Papillons, un splendide grand papillon nocturne voleta jusqu’à la fenêtre. Mais il se tint éloigné de la lumière et ne se brûla pas les ailes. Ce fut un bon signe pour moi; le fandango me trottait pourtant bien trop dans la tête—bien que cette idée merveilleuse, aux figures divines, soit encore plus adaptable que le bal masqué [Papillons]. Schumann décida finalement de ne pas publier son fandango mais de l’incorporer dans sa Sonate pour piano en fa dièse mineur op. 11, où il apparaît, juxtaposé à un motif de quintes cullando, comme thème principal Allegro du mouvement initial. Les quintes semblent avoir été une référence délibérée à la dernière des Quatre pièces caractéristiques, op. 5, de Clara Wieck—une pièce intitulée «Le Ballet des revenants», qui contient également un thème remarquablement analogue à celui du fandango de Schumann, bien que dans ce cas l’emprunt du matériau fût probablement le fait de Clara. Les pages initiales de la Sonate, op. 11, de Schumann sont clairement étiquetées «Introduzione», quoique leur caractère mélodique pleinement formé leur confère l’aspect d’une entité indépendante. Même la réapparition de son thème au cœur de l’Allegro suivant agit davantage comme une interruption du flot du développement musical que comme une partie intégrante. Certes, l’introduction se focalise sur le motif de la quinte descendante qui va constituer le point de départ de l’Allegro, mais son isolement du corps principal du mouvement est accentué par un trait fort insolite: la douce mélodie qui se déploie peu après son commencement est le thème du mouvement lent de la sonate. Ce morceau d’anticipation à long terme, étonnamment original, n’est en rien un geste gratuit, puisque la quinte descendante figure aussi au premier plan dans le mouvement lent. Schumann achève l’introduction sur une de ses expérimentations typiques dans la sonorité pianistique, la quinte descendante émergeant pianissimo d’un tourbillon sonore flou. L’Allegro est dominé par ce que Schumann appela son idée de «fandango». Le seul contraste important est fourni par un thème paisible, en majeur, qui surgit à la fin de l’exposition et joue le rôle d’un second sujet traditionnel. Même là, cependant, le motif de la quinte descendante, au rythme pointé demeuré intact, est absorbé comme figure d’accompagnement. Le mouvement lent, désigné comme une «Aria», repose en fait sur une chanson composée par Schumann à dix-huit ans, alors qu’il était étudiant. (Cette chanson, An Anna, sur un poème de Justinus Kerner, resta inédite jusqu’à ce que Brahms l’inclût dans le supplément de l’édition des œuvres complètes de Schumann, publié en 1893.) Dans la mise en musique pour piano de Schumann, le début de la mélodie se déploie, fait révélateur, sur une quinte juste tenue, dans la basse, tandis que l’indication senza passione, ma espressivo souligne son délicat air d’amoindrissement. Dans la critique qu’il consacra à cette sonate (en même temps qu’à la Sonate en fa mineur, op. 14, et aux Impromptus sur un thème de Clara Wieck, op. 5), dans la Gazette musicale de Paris, Liszt loua tout particulièrement le mouvement lent, qu’il décrivit comme «un chant d’une grande passion, exprimé avec plénitude et calme». Les quintes descendantes qui ponctuent la mélodie ne se trouvent pas dans la chanson originelle et furent à l’évidence ajoutées pour faire ressortir l’unité de la paire de mouvements initiale de la sonate. La trame du troisième mouvement cèle la notion d’un scherzo de forme ouverte, avec deux trios. Le tempo s’accélère pour le premier quasi trio, dont les mesures d’ouverture sont étayées par le motif de quintes cullando du premier mouvement, joué pianissimo leggierissimo. Le second trio—que Schumann baptise «Intermezzo»—présente une écriture très ironique. Il abandonne brusquement le style agitée aventureux, pour ce qui semble une parodie de l’école d’autrefois. Fondamentalement, cet épisode est une polonaise absurdement lourde, que Schumann marque, fort opportunément, Alla burla, ma pomposo. Il est possible que nous nous trouvions en présence d’un Papillon—peut-être un extrait du corpus perdu des «XII Burlesken (burle) dans le style de Papillons», que Schumann avait envoyé aux éditeurs Breitkopf und Härtel en 1832. Avant que le scherzo puisse revenir, une autre surprise nous attend, sous la forme d’un récitatif plutôt orchestral avec un «Papillon» qui prend son envol sur le hautbois mais est rejeté à l’unanimité, avec colère. Pour ajouter à la confusion, le scherzo revient à la mauvaise tonalité pour être lancé dans le mode correct deux mesures plus tard—une touche typiquement schumannesque. Le finale comporte encore de sonorités orchestrales: des trémolos profonds dans les graves, par-dessus lesquels la texture gagne de plus en plus en poids, tel un crescendo sur un roulement de tambour; un passage staccato près de la fin, marqué «quasi pizzicato»; des accords tutti lâchés à vitesse maximale (une des caractéristiques qui font de ce morceau un formidable défi technique pour le pianiste). Cette sonate-rondo, fondée sur un thème à deux temps contraint dans la camisole d’une mesure à trois temps, était en fait la première partie de la sonate à être composée. Bien que dépourvue de la cohérence et de l’ampleur éclatantes du mouvement initial, la musique, forte de son élan et de son inventivité, entraîne l’auditeur, sans faillir, jusqu’à la conclusion triomphante en fa dièse majeur. La Sonate, op. 11, fut une source de profond chagrin pour Schumann. Plus tard, il la décrivit à Clara comme «un long cri du cœur vers toi», et il est significatif que le nom de sa bien-aimée parût en grandes lettres sur la page de titre de l’édition originale—une marque d’affection romantique. Le nom de Schumann lui-même était remarquablement absent, la dédicace étant simplement: «A Clara, de la part de Florestan et Eusebius». Ce fut en lui envoyant cette partition nouvellement publiée, en mai 1836, que Schumann prit pour la première fois consciense de l’implacable opposition du père de Clara à toute relation sérieuse entre eux. Wieck chargea sa fille de retourner toutes les lettres de Schumann, et elle s’exécuta docilement. Schumann passa l’été de la meme année à mener à bien l’essentiel de son travail sur sa Sonate pour piano en fa mineur op. 14. Ce fut, comme il le confessa par la suite, sa «période la plus sombre»—une époque qui le vit totalement séparé de Clara. Si certaines idées musicales de Clara avaient laissé leur empreinte sur le mouvement initial de la Sonate en fa dièse mineur, cette nouvelle œuvre plaça littéralement la jeune femme au centre de la scène: telle que Schumann la conçut originellement, la sonate comportait cinq mouvements, avec le mouvement lent encadré de deux scherzos. Or, ce mouvement lent est un ensemble de variations sur un «Andantino de Clara Wieck»; plus encore, la gamme descendante de cinq notes qui en débutait le thème imprégna aussi d’autres sections de l’œuvre—le thème principal du mouvement initial n’étant pas la moindre. Selon toutes probabilités, ce fut l’éditeur Tobias Haslinger qui persuada Schumann d’abandonner les deux scherzos de sorte que l’œuvre pût paraître sous le titre accrocheur de «Concert sans orchestre». Cette désignation tout à fait inapte fut critiquée par Liszt dans sa Gazette musicale, mais aussi par Ignaz Moscheles, le dédicataire de l’œuvre. La version à trois mouvements de Haslinger parut en octobre 1836 mais Schumann en publia une version révisée intitulée «Grande Sonate» (1853). Il rétablit l’un des scherzos et refit le finale, changeant le signe de la mesure 6/16 en un 2/4 plus conventionnel. (La seconde altération peut faire paraître la musique moins redoutable sur la page imprimée, mais elle ne fait rien pour faciliter l’exécution de ce qui demeure une pièce effroyablement difficile.) Schumann retoucha également le mouvement initial, effectuant d’occasionnels changements de texture, de rythme, voire d’harmonie. De toutes les œuvres pianistiques de Schumann, cette pièce est peut-être la seule à être supérieure dans sa forme révisée et Nikolai Demidenko s’est généralement tenu à cette version. Il a cependant conservé un ou deux taits de la première version, préférables—notamment l’accord tenu qui suit la rafale de doubles croches dans les mesures initiales de la sonate. La version révisée présente ici un accord évident d’ut majeur, mais Schumann écrivit originellement une dissonance qui propulse l’argument musical suivant avec davantage de force et d’intensité. Lorsqu’il prépara la version révisée de sa sonate, Schumann ne reprit pas le scherzo en fa mineur, décision assez compréhensible, non seulement parce que l’œuvre, en tant que tout, est plus convaincante dans une forme plus tendue, à quatre mouvements, mais aussi parce que la section en trio de ce scherzo est relativement faible. Le scherzo même, avec ses phrases continuellement syncopées, n’en constitue pas moins une pièce splendide, qui figure sur le présent enregistrement comme le deuxième mouvement de la sonate. Les variations centrales (ou «Quasi Variazioni», comme les appelle prudemment Schumann) forment peut-être le plus beau et le plus parfait de tous les mouvements de sonate du compositeur. A nouveau, cependant, il fallut quelque temps pour qu’elles parvinssent à leur forme définitive. Deux variations incluses dans l’autographe original de Schumann, mais abandonnées avant que la sonate vît le jour, ne furent publiées que tout récemment, en 1983. L’intention de Schumann quant à la seconde de ces variations—un Prestissimo qui porte le titre de «Scherzo»—demeure peu claire, car cette pièce, qui figure entre les troisième et quatrième variations, n’est pas numérotée indépendamment. Peut-être Schumann l’avait-il déjà jugée superflue à l’époque? Aussi n’a-t-elle pas été insérée dans le présent enregistrement. A contrario, Nikolai Demidenko interprète la première des variations posthumes, revenant, par ce faire, à la séquence originale prévue par Schumann pour le mouvement, dans sa forme plus ample. Am Clavier kam der Fandangogedanke über mich—da war ich ungemein glücklich. Wie ich aufhörte, sah ich noch zum Fenster heraus u. am schönen Frühlingshimmel hinauf—leise Luftwogen fühlt’ ich da; auch eine Nachtigall hört’ ich so innig—Und wie ich so recht an die Papillons dachte, schwärmte ein schöner, großer Nachtschmetterling an’s Fenster heran. Er blieb aber fern vom Lichte, u. versengte sich die Flügel nicht. Aber der Fandango ging [mir] gar zu sehr im Kopfe herum. Das ist aber auch eine himmlische Idee mit Göttergestalten u. noch plastischer, als der Maskenball. Schumann entschied sich schließlich gegen eine Veröffentlichung seines Fandangos und arbeitete diesen in seine Klaviersonate in fis-Moll op. 11 ein, in der er als Allegro-Hauptthema des einleitenden Satzes neben ein „wiegendes“ Quintenmotiv gestellt wird. Die Quintenidee scheint eine bewußte Bezugnahme auf das letzte von Clara Wiecks Quatre pièces caractéristiques, op. 5 gewesen zu sein, das den Titel „Le Ballet des revenants“ („Ballett der Geister“) trug. Clara Wiecks Stück enthält zudem ein Thema, das dem in Schumanns Fandango bemerkenswert ähnlich ist, und es ist anzunehmen, daß sie in diesem Fall das Material von ihm entlehnt hat. Die ersten Seiten von Schumanns Sonate, op. 11 tragen ganz unverkennbar das Etikett einer „Introduzione“, obwohl ihr vollendet gestalteter melodischer Charakter ihnen den Hauch eines distanzierten Wesens verleiht. Selbst das einleitende Thema, das in der Mitte des nachfolgenden Allegros abermals ertönt, ist vielmehr eine musikalische Unterbrechung der Durchführung als ihr integraler Bestandteil. Es ist richtig, daß die Einführung sich auf das Motiv der absteigenden Quinten stützt, von dem auch das Allegro schließlich seinen Ausgang nimmt, doch ihre Isolation vom Hauptmaterial des Satzes wird durch ihre auffälligste Eigenschaft noch untermauert: Die sanfte Melodie, die sich kurz nach dem Beginn entfaltet, ist das Thema des langsamen Satzes der Sonate. Diese überraschend originelle, weit vorausgreifende Passage ist keineswegs eine unnötige Geste: Die absteigenden Quinten charakterisieren auch den langsamen Satz sehr deutlich. Zum Einführungsende hin vollzieht Schumann auf dem Klavier eines der für ihn so typischen Wohlklangs-Experimente, indem die absteigenden Quinten pianissimo aus einem verschwommenen Tonwirbel emporsteigen. Das Allegro wird von der „Fandango“-Idee, wie Schumann sie nannte, dominiert. Der einzige bemerkenswerte Unterschied ist ein ruhiges Thema in Dur, das gegen Abschluß der Exposition ertönt und die Rolle eines traditionellen zweiten Themas übernimmt. Obwohl das Motiv der absteigenden Quinten nun in einer begleitenden Figur versinkt, bleibt sein punktierter Rhythmus intakt. Schumann bezeichnete den langsamen Satz, der auf einem Lied basiert, das er als achtzehnjähriger Student geschrieben hatte, als „Arie“. (Das Lied, An Anna, zu Worten von Justinus Kerner wurde erst veröffentlicht, als Brahms 1893 Schumanns gesammelte Werke herausgab.) In Schumanns Klaviervertonung entwickelt sich der der Melodienanfang bezeichnend über einer gehaltenen, vollkommenen Quinte der Baßstimme, und die zart angedeutete Untertreibung wird durch die Markierung mit senza passione, ma espressivo noch verstärkt. Als Liszt die Sonate (zusammen mit der Sonate in f-Moll, op. 14 und den Impromptus über ein Thema von Clara Wieck, op. 5) für die Pariser Zeitschrift Gazette musicale rezensierte, hob er den langsamen Satz als besonders lobenswert hervor und beschrieb ihn als „ein Lied großer Leidenschaft, die mit Fülle und Ruhe ausgedrückt wird“. Die die Melodie betonenden, absteigenden Quinten sind im ursprünglichen Lied nicht vorhanden und wurden zweifellos hinzugefügt, um die Einheit des eröffnenden Satzpaares der Sonate weiter zu betonen. Hinter dem Gerüst des dritten Satzes offenbart sich das Konzept eines durchkomponierten Scherzos mit zwei Trios. Im ersten Quasi-Trio, dessen einleitende Takte vom „wiegenden“ Quintenmotiv, pianissimo leggierissimo, des ersten Satzes gestützt werden, wird das Tempo erhöht. Das zweite Trio—oder „Intermezzo“, laut Schumannn—wurde mit einem großen Maß an Ironie komponiert. Abrupt verwirft es zugunsten einer scheinbaren Parodie der altmodischen Schule den bisher erregten, kühnen Stil des Stückes. Das Zwischenspiel ist in seinem Kern eine absurd schwerfällige Polonaise, die Schumann recht passend mit Alla burla, ma pomposo markierte. Es ist kaum anzuzweifeln, daß wir es hier mit einem Papillon zu tun haben—vielleicht ein Auszug aus der verloren gegangenen Sammlung von „XII Burlesken im Stile von Papillons“, die Schumann 1832 an die Herausgeber Breitkopf und Härtel gesandt hatte. Ehe das Scherzo wiederaufgenommen werden kann, steht uns in Gestalt eines orchestral ausgerichteten Rezitativs, vollständig mit einem auf der Oboe dahinfliegenden „Papillon“, den das ganze Orchester schließlich wütend in die Schranken weist, eine weitere Überraschung bevor. Um die Verwirrung komplett zu machen, wird das Scherzo in falscher Tonhöhe wieder aufgenommen, ehe es nach ein paar Takten schließlich in der richtigen Tonart erscheint—ein Kunstgriff ganz in der Manier Schumanns. Das Finale verbreitet weitere orchestrale Wohlklänge: Tiefe Tremoli im Baßregister, über denen die Struktur allmählich an Gewicht zunimmt, ganz wie ein Crescendo über einem Trommelwirbel; eine mit „quasi pizzicato“ markierte Staccato-Passage am Ende; sehr schnelle, gehämmerte Tutti-Akkorde (eines der zahlreichen Charakteristika dieses Stückes, das für jeden Pianisten eine ausgezeichnete technische Herausforderung darstellt). Dieses Sonaten-Rondo, das sich auf ein in drei Schlägen je Taktstrich hineingezwungenes Thema in doppeltem Versmaß stützt, war tatsächlich der erste Teil jener Sonate, deren Komposition noch bevorstand. Sollte es dem einleitenden Satz auch an Kohärenz und Dramatik fehlen, so geleitet der élan und die Intensität der Musik den Hörer stets bis zum triumphierenden Abschluß in Fis-Dur. Die Sonate des op. 11 war für Schumann Ursache großen Schmerzes. Er beschrieb sie später Clara gegenüber als „ein langer Schrei meines Herzens nach dir“, und es ist des weiteren charakteristisch, daß ihr Name in großen Buchstaben auf der Titelseite der Originalausgabe steht—ein Ausdruck romantischer Zärtlichkeit. Zudem war auch das Fehlen von Schumanns eigenem Namen auffällig, denn die Überschrift lautet ganz einfach: „Clara zugeeignet von Florestan und Eusebius“. Nur als Schumann ihr im Mai 1836 die erst kurz zuvor veröffentlichte Partitur zusandte, wurde ihm erstmals der unerbittliche Widerwillen ihres Vaters gegen jegliche ernsthafte Beziehung zwischen den beiden bewußt. Wieck wies Clara an, alle Briefe Schumanns an diesen zurückzusenden, und sie gehorchte widerspruchslos. Im Sommer desselben Jahres, 1836, arbeitete Schumann den Großteil seiner Klaviersonate in f-Moll op. 14 aus. Dies war, wie er später einräumen sollte, seine „schwärzeste Zeit“—eine Zeit, in der er völlig von Clara getrennt war. Wenn bisher einige von ihren musikalischen Ideen ihre Spuren am Rande des einleitenden Satzes der Sonate in fis-Moll hinterlassen hatten, so bildete Clara nun buchstäblich den Mittelpunkt des Werkes: Schumann hatte ursprünglich eine fünfsätzige Sonate geplant, den langsamen Satz eingerahmt in zwei Scherzos. Der langsame Satz lieferte nicht nur eine Variationsreihe über ein „Andantino de Clara Wieck“, sondern die ihr Thema eröffnende, absteigende Fünfton-Skala durchdrängte auch andere Abschnitte der Arbeit—nicht zuletzt das Hauptthema des einleitenden Satzes.